Automotive Artist Robert Mittenmaier explains how Peter Helck became his protégé and how an ancient Chinese game of chance led to painting cars. Part One. You know, often times when I tell people that I paint cars, they reply that their vehicle could use a fresh coat of paint. When I explain that I paint pictures of cars, I often receive a blank stare in reply. 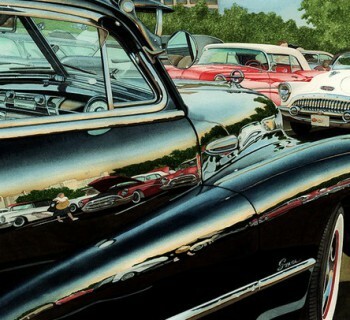 So many people don’t know about automotive art and the automotive art movement. But we’re slowly converting them [laughs]. I’ve always been the guy in the back of the classroom doodling and drawing. I graduated from the University of California-Berkely with a degree in fine arts. I remember thinking, now what? In the early 70's ,graduates in painting were totally unprepared to earn a living from their art. I fell into retail. I needed a job that Christmas so I went to work in a store – essentially just for the holidays – but it turned into a career. I did that for a couple years in California and really let my art fall by the wayside. I realized after a while that I missed it! So I took a step back and asked myself, “What do I want to do?” The answer was so simple. I’m a California car nut. I want to paint cars. So I up and quit my day job, moved from California to Reno, Nevada to go to work for Bill Harrah, the casino magnet. At the time he had the world’s largest car collection and research library devoted to the automobile. If I worked for his casino, I could get into the car collection every day for free! I was determined that my first painting would be The Thomas Flyer – one of the most famous racecars in the world and a keystone of the Harrah collection. And so I worked at the casino, managing a game called keno. It’s an ancient Chinese game of chance and, interestingly enough, the only game in a casino that uses a paintbrush! Each day I went to visit the car collection. My original theory, which I still use today, is to paint each car like a portrait. After that I research the heck out of it and find out all that I can about the background of car and put the two together. I think it is paramount to see the car’s background. For instance, if the car is in a museum in California and it is originally from Florida, I would go to each and paint accordingly. There were to be no compromises in the background or the car itself. As a result, it took me over a year to do my first painting. From there, I determined that I wanted to do a series of the early American racecars. I met my wife while living in Reno and we’ve been married ever since. We decided to move to Washington together and then I would start my next piece. Now, 30 years ago there were nowhere near as many restored racecars as there are today. 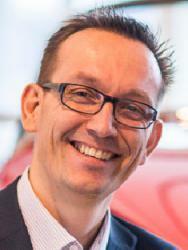 Someone owned the next one I went after I consider the dean of automotive artists in the United States – Peter Helck. Peter is an amazing man. He lived in a place called Boston Corners, New York. I brought them both in to the studio and we spent a marvelous afternoon talking about art and the automotive art scene. At the end of the day Peter told me that he was so glad I had driven up and arrived unannounced. At the time he was in the midst of writing and illustrating an automotive history book and he told me that if I’d written or called he would have had to decline a visit. I was so thrilled to have had the opportunity to meet him and we kept in touch until he died. I would do paintings and send them to him. Then Peter would critique them and send them back. It was an incredible experience for me and I am so fortunate to have had the opportunity to connect with Peter. I still admire him and his work so much. 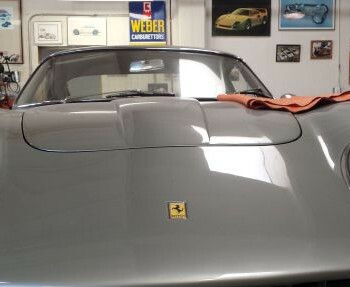 In our next blog Robert continues his story and how he started painting Ferraris. READ PART TWO. Visit his website if you want to see more of his work.